The ‘Badger’s’ entertained Monte Mar on Monday who were lying at the top of the division. A solid team game resulted in a great result from the ‘Badger’s’, winning on four rinks and narrowly getting the overall shots by 99 points to 95. 10 points to the ‘Badger’s’ and 4 to Monte Mar. Winning rinks were Geoff Eggleton, Graham Richardson and Peter Dix. 19 – 8. Brenda Jiggins, Niel West and Geoff Paylor 18 – 9. Lynne Bryce, Derek Jiggins and Andy Bryce 19 – 18. Dean Webb, John Hassell and John Mallet 19 – 14. Well done to the ‘Badger’s’. 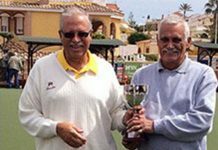 On Wednesday, there was no such victory for Country Bowls ‘Herons’ playing against the strong squad from San Miguel. The ‘Deputies’ were ‘on fire’ and resulted in an excellent score. 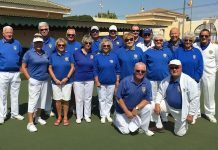 The ‘Herons’ won on one rink thanks to Brenda Jiggins, gaining 2 points and while John Mallet and John Hassell made a good fight with the pairs they finally went down 15 – 18. The rinks and trips went down easily although they put up a good fight. All in all a pleasant and friendly match on a hot sunny morning. 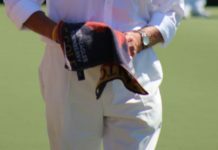 Monday found the Buckskins playing host to San Luis Hercules on a hot day that started without a breath of wind, which as always was followed by just a touch of breeze, but as we know that’s all it takes to alter your bowling line. The match ended as a draw with 3 rinks and 97 shots each, it always makes you think of your stray woods that would have earned you the extra shot and hence the extra point, but alas it could have been any shot by any player. Dolly Ford, Pam Harris and Brian Harris 26-15. Lesley Day, Marion Haynes and Dave Haynes 12-16. Ann Abbott, Bob Day and Malc Elmore 14-24. David Wright, Graham Day and Keith Longshaw 16-10. Tony Abbott, Ann Taylor and Jim Taylor 19-13. Janet Wright, Peter Blackburn and Malc Sykes 10-19. 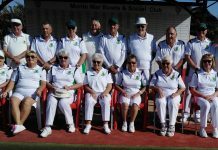 On Wednesday morning El Rancho entertained Emerald Isle Earls in their VCL match and continuing with the positive selection system of playing all bowlers in differing positions for experience. El Rancho took the pairs and rinks, whilst losing both singles and trips, but a good effort all round against a strong opponent. Ladies singles: Shirley Edwards 15-21. Gents singles: John Skipper 8-21. Pairs: Jane Hamill and Richard Lee 16-13. Trips: Ron Edwards, Stew Hamill and Rob Clark 5-29. Rinks: Bob Easthope, Sheila Cooper, Jean Bagwell and Carolyn Harris 15-13. For membership details contact Brian Taylor on 965077093 or at briantaylor_es@yahoo.co.uk or Carolyn Harris on 966774316 or at elranchobowls.secretary@gmail.com. This Monday we were away to La Marina Pilots who are 2nd top in the Hurricane Division. Save for the last four or five ends in the last three matches it could all have been so different! After thirteen ends we were leading or drawing on four rinks, but with La Marina maintaining a great challenge, we eventually capitulated, and won on only one rink. 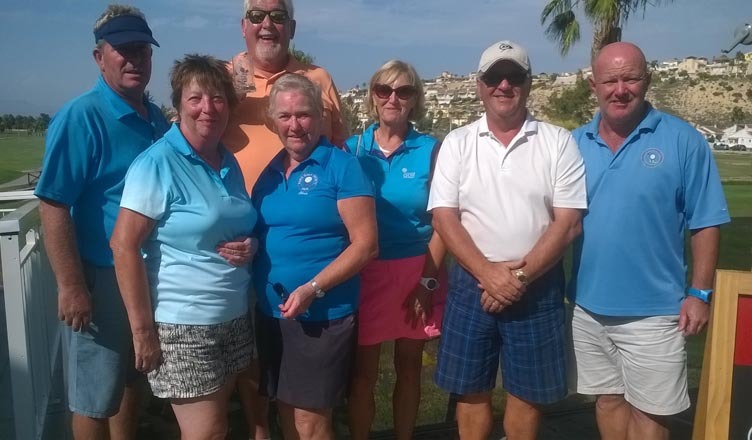 The successful team were Carol Linehan, Ken Barber and once again Roy Thompson, who won by 23 – 11. Roy has been on a roll this season, and has shown the rest of us how to do it. Anyway, La Marina took the spoils by five rinks to one, the overall shots by 114 to 92, and the overall match result by 12 points to 2. Thanks to Paul and his team for their hospitality, friendliness and sportsmanship, it was an excellent morning’s bowling. We are holding 3rd place in the table at the moment and with two matches left to play we really need to finish up the way we started and that is with a win. Tracey Paffitt, Linda Hier, Roy Thomson and Bryan Eatough 18 – 12, so very well done to all of you. In the ladies singles discipline our representative was Margaret Odell who lead for the most part of the match to reach 19 shots but just couldn’t get the last 2 shots. La Marina crept up end by end to take the match 21 – 19. We lost on 4 rinks gaining only 2 points to La Marina’s 10 and the total shots were Horadada 81 La marina 91. In the VCL league we are in 4th place with one more match to play. This is a home match against Country Bowls and we are going to get our own back and come away with a win. Aren’t we team? The 10-4 victory this week against San Miguel has assured that QBC Tigers are champions of division 3, but as they have a bye next week, we don’t know what the margin will be. 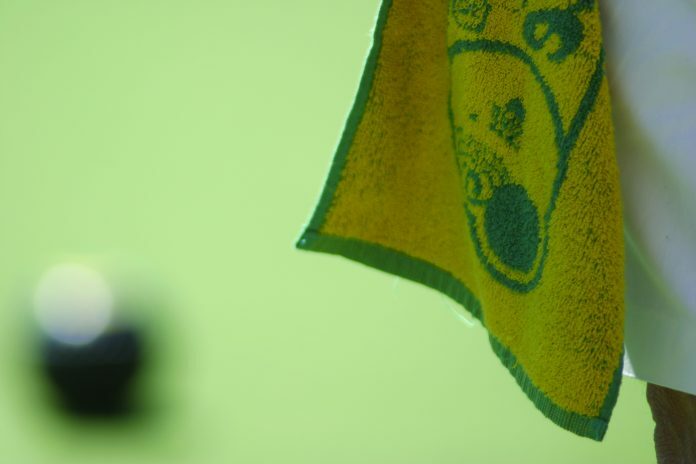 Wins for Mel Highland (ladies singles), Terry Morgan (mens singles), Kevin McKenna & Alan Barton (pairs), plus Ian Forbes, Carol & Keith Lowry (trips) did the business for the Tigers with a brilliant points score of 107 – 59. Quesada Lions had a wonderful result taking all 12 points away to Vistabella Saxons and shots 117 – 60. Great bowling from all the players. Team Captain Deidre Leeming said, “I was reserve this week, but so proud of the team spirit and camaraderie.” Lions are still in second place but have closed the gap to 10. The last match of the season next week is at home against the league leaders San Luis Falcons. The Lions need 11 points to win league – fingers crossed! The Cheetahs had a bye in the VCL league this week. 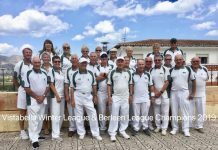 The Blenheims had some very hard fought games playing away at San Luis with 3 of the Quesada teams fighting right up to the last end. Although the points were 10-4 in favour of San Luis Wellingtons, with shots 119-92, the Blenheims are still chasing them hard for the top spot in the league. Currently in second place only four points behind San Luis, its still all to play for! 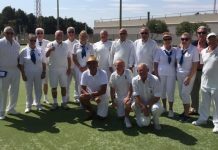 San Luis Bowls Club Report 22.06.18. We’ve reached the summer solstice and the heat moves up another notch – where’s that breeze when you need it? Fortunately for some of us, the leagues are nearly finished. South Alicante Summer League: Monday 18th June SL Wellingtons home v Quesada Blenheims, had a good result, shots 119-92, points 10-4. Winners: Helen Hammond, Ray Pollock, Scott Malden 18-16, Margaret Morrison, Sab & Russell Marks 28-9, Bob White, William Holtham, Vic Slater 16-14, Sheila Cammack, replaced by Jan Pocock, Brian Pocock, Phil Morrachan 26-13. The Wellingtons are at the top of Spitfire league with 73 points, with Quesada Blenheims on 69. SL Hercules had an unbelievably close result away v El Rancho, 7-7, shots 97-97. Winners: Dennis Jackson, Ray Watmough, Ralph Jones 19-10, Ian Ross, Ken Dullaway, Les Bedford 24-14, Chris Jackson, Bill Webb, Brenda Brown 16-12. Hercules are 2nd in Harrier league on 53 points behind Monte Mar Torro on 59, so all to play for last match v MM Torro! Wednesday 20th June VCL: SL Falcons away v San Miguel Sherrifs, a good result, 8-4, shots 86-83. 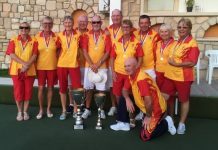 Winners: Singles – Kath Reid 21-14, Ian Kenyon 21-20, Rinks – Margaret Morrison, Jan & Brian Pocock, Russ Marks 21-7. Falcons still in 1st place on 81 points, ahead of Quesada Lions, 71. SL Hawks home v La Siesta had a very positive result; 8-4, just snatching the shots 77-76. Our Pairs, Les Bedford & Charlie Marigold, were always in control, winning 26-11. Our Rinks; Kath Waywell, Ken Dullaway, Ian Ross & Brenda Brown had a real nip and tuck match. Going into the last end 11-12, and 1 down in the head, Brenda, with a well judged shot, took out shot wood perfectly to hold 2 for another win. Our Trips; Dennis Jackson, Ralph Jones & Barry Edwards had to work extra hard in the heat with 3 dead ends courtesy of La Siesta. 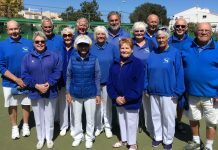 They had a real game of 2 halves, all square 6-6 after 9 ends but then they took control winning 20-11 and their 2 shots on the last end were just enough to take the over-all shots. A real team effort by the HAWKS who are currently 3rd on 75 points, still chasing Emerald Isle Earls on 82; it should be an interesting last match. Congratulations to Quesada Tigers Div 3 winners on 103 points. 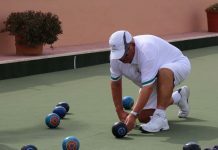 Club website: www.sanluisbowls.byethost7.com or contact June Jones, Captain: 691903773. SA Spitfire League. 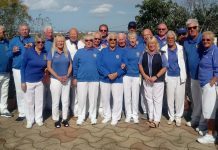 The Greenways did us proud at Quesada this week, with wins on four rinks, two defeats by very close margins and a win also from our friendly team..well done all. Mike Irwin, Carol Thorpe & Peter Whitehall 28-7. Pauline Rafferty, Sandra Burrows & Maggie Furness 19-9. Lin Watkins, Charlie Watkins & Pat Rafferty 15-13. Rosemarie Savage, Bill Corbishley & Stuart Allman 15-12. Shots, VB 103(10) -73(4) Q. Winning friendly team..Sue Jenkins, Jeff Neve & Ken Savage. VCL. The Vikings continue to climb from bottom of the league to third place after their great win at the Emerald Isle, wins on all but one discipline this week..Lin Watkins continued to add another win to her achievements, this week she won the Ladies Singles 21-9. Charlie Watkins & Gary Thorpe had another great win in the pairs of 26-12. Frank Barclay, Jeff Neve & Eric Bishop won 16-14 and the Rinks team of Beryl Regan, Bill Corbishley, Mike Regan & Carol Thorpe won 19-17. Shots, VB 97(10) – 73(2) EI. The Saxons at home to Quesada found the going difficult and lost on all rinks. Shots, VB 60(0) – 117(12)/Q. Next weeks result is vital..we are all routing for you. Men’s 4 wood pairs league. Our guys have done so well and this weeks results didn’t disappoint, home & away to Quesada for their final game the home team of Del Gunning & Peter Whitehall pulled off a win of 22-9 making it worth three points, unfortunately the away team lost by just two shots but this could still mean they have done enough to win the league…watch this space! In the Spitfire League, the Christians were away to the Emerald Isle Victors this week and came away with 5 points. The wins came from Paul Hayward, Bob Graham & Val Hignett and Pat McEwan, Dave Champion & Dave McEwan, while Bob Hanton, Jack Jackson & Bob Donnelly were able to add a point for a draw. Shots were very close again 100:105. In the Hurricane League, the Moors were home to La Siesta Wasps. The team were able to maintain their 22 point lead at the top of the table with a 12:2 victory, shots 108 to 67. The winning rinks were as follows: Reg Cooper, Lee Sinclair (who came on for an injured Johnny Raby) & Gary Raby, 20:11; Jan Allen, Dave Greenland & Lynn Greenland, 18:13; Sue Milner, Dave Johnson & Steve Cantley, 15:9; Bob Nesbitt, Cliff Plaisted & Stuart Denholm, 19:5 and Tony Sansom, Brian Allen and Mary Dyer, 21:12. In the VCL, the Deputies went to Country Bowls and came away with an excellent 10:2 win. Unfortunately I don’t have the breakdown of the results, but this keeps the Deputies firmly in 2nd place with 1 game to go. A win next week could see them top. The Sherrifs had a slightly better result this week to last, gaining 4 points against the top of the league team, San Luis Falcons. Wins came from Lynn Greenland & Stuart Denholm in the Pairs, 23:9 and Cliff Plaisted, Dave Greenland & Steve Cantley in the Triples, 19:14. The overall shots were close at 83:86. The Marshalls, however, came away bitten by the Quesada Tigers. The team managed just 2 points thanks to the Rinks team of Sue Milner, Sheila Booth, Bob Graham & Eddy Cowan, 22 shots to 21. 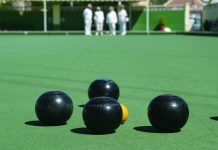 If you are thinking of taking up bowls, why not come to Wasps on Wednesdays 1pm for 1:30 start. €5 for an afternoon’s bowling with shoes and woods available to borrow.